Valentine craft just have to be in the shape of a heart. 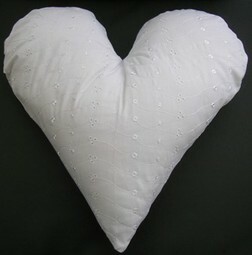 Giving a valentine craft heart shaped cushion is a lovely thought. These cushions are cuddly and great to add to your comfort. 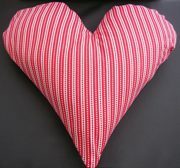 This is a different shape for cushions but also a good shape to compliment other cushions or hang little hearts around your room. The larger cushions are 19 ins (48cms)long and 18 ins (46cms) wide. The depth of the V in the centre is approximately 4 ins (10cms). This cushion is made from White Broderie Anglais fabric. The embroidered effect is very subtle. There is a zip fastening in the middle of the back. 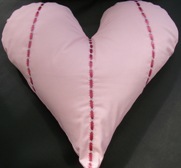 This cushion is made from pink polyester cotton and has a darker pink ribbon effect stitched onto the front. The fastening in the middle of the back is made from Velcro. 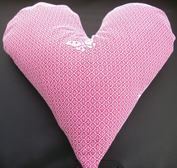 This cushion is made from bright pink polyester cotton. The colour has been toned down slightly by having a lacy outer cover that has embroidered butterflies on it. The lovely bright red and white striped material on this cushion really stands out well. The Velcro fastening is down the centre back. 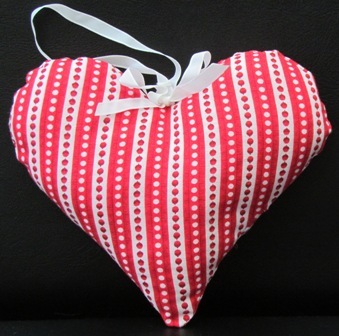 These small mini heart cushions are just the right size for hanging decorations anywhere in the home/car or caravan. One of the advantages of these little hearts is that they will not damage your doors, walls or furniture as they are soft like cushions. A smaller version of the larger one. At the base of the hanging loop there is a bow in matching ribbon. 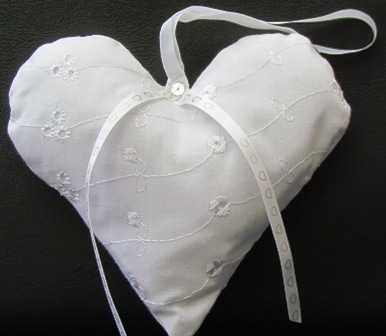 This small hanging heart is made from white Broderie Anglais. At the base of the hanging loop there is a silver sequin with longer strips of white heart printed ribbon.